The School of Nursing and Midwifery at the University of Southampton introduced an EBL approach for all preregistra­tion nursing and midwifery programmes at Diploma, Advanced Diploma and Bachelor level in September 1997. The selection of the EBL process followed a review and subsequent develop­ment of the curriculum, which recognised that students needed to develop a questioning approach to evidence-based practice early in their course. A variety of strategies were considered to enhance the need for enquiry and thus capitalise on students’ natural thirst for knowledge. 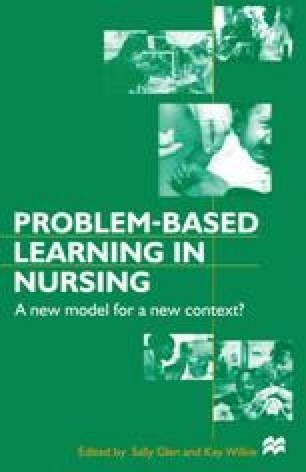 EBL captures the initial motivation and continuing need of individuals to learn, and, by permitting the exploration of the status of current knowledge on a wide range of issues relevant to healthcare, complements the notion of evidence-based practice with the ever-present need to review the rationale for assumed knowledge (ENB, 1998).